At the end of the nineteenth century, Johnstown, Pennsylvania, was a booming coal-and-steel town filled with hardworking families striving for a piece of the nation’s burgeoning industrial prosperity. In the mountains above Johnstown, an old earth dam had been hastily rebuilt to create a lake for an exclusive summer resort patronized by the tycoons of that same industrial prosperity, among them Andrew Carnegie, Henry Clay Frick, and Andrew Mellon. Despite repeated warnings of possible danger, nothing was done about the dam. Then came May 31, 1889, when the dam burst, sending a wall of water thundering down the mountain, smashing through Johnstown, and killing more than 2,000 people. It was a tragedy that became a national scandal. Again that morning there had been a bright frost in the hollow below the dam, and the sun was not up long before storm clouds rolled in from the southeast. By late afternoon a sharp, gusty wind was blowing down from the mountains, flattening the long grass along the lakeshore and kicking up tiny whitecaps out in the center of the lake. The big oaks and giant hemlocks, the hickories and black birch and sugar maples that crowded the hillside behind the summer colony began tossing back and forth, creaking and groaning. Broken branches and young leaves whipped through the air, and at the immense frame clubhouse that stood at the water's edge, halfway among the cottages, blue wood smoke trailed from great brick chimneys and vanished in fast swirls, almost as though the whole building, like a splendid yellow ark, were under steam, heading into the wind. The colony was known as the South Fork Fishing and Hunting Club. It was a private summer resort located on the western shore of a mountain lake in Cambria County, Pennsylvania, about halfway between the crest of the Allegheny range and the city of Johnstown. On the afternoon of Thursday, May 30, Memorial Day, 1889, the club was not quite ten years old, but with its gaily painted buildings, its neat lawns and well-tended flower beds, it looked spanking new and, in the gray, stormy half-light, slightly out of season. In three weeks, when the summer season was to start, something like 200 guests were expected. Now the place looked practically deserted. The only people about were a few employees who lived at the clubhouse and some half dozen members who had come up from Pittsburgh for the holiday. D. W. C. Bidwell was there; so were the young Clarke brothers, J. J. Lawrence, and several of the Sheas and Irwins. Every now and then a cottage door slammed, voices called back and forth from the boathouses. Then there would be silence again, except for the sound of the wind. Sometime not long after dark, it may have been about eight thirty, a young man stepped out onto the long front porch at the clubhouse and walked to the railing to take a look at the weather. 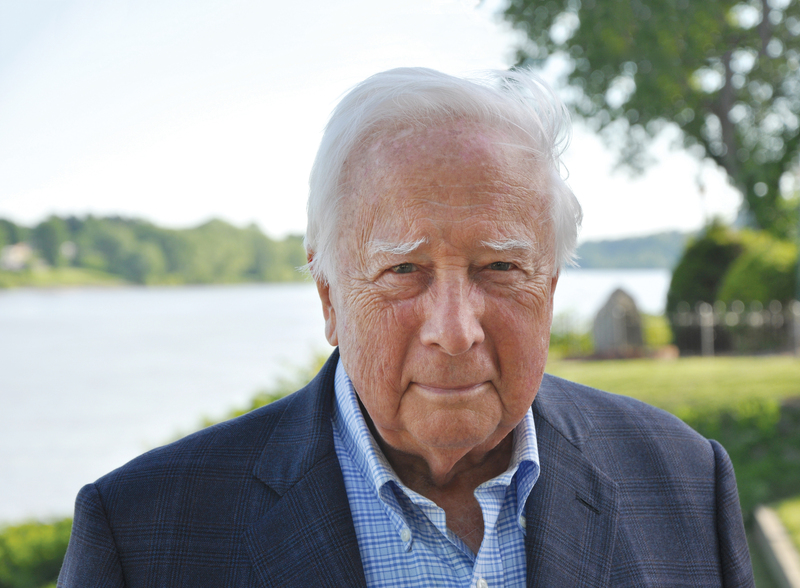 His name was John G. Parke, Jr. He was clean-shaven, slight of build, and rather aristocratic-looking. He was the nephew and namesake of General John G. Parke, then superintendent of West Point. But young Parke was a rare item in his own right for that part of the country; he was a college man, having finished three years of civil engineering at the University of Pennsylvania. For the present he was employed by the South Fork Fishing and Hunting Club as the so-called "resident engineer." He had been on the job just short of three months, seeing to general repairs, looking after the dam, and supervising a crew of some twenty Italian laborers who had been hired to install a new indoor plumbing system, and who were now camped out of sight, back in the woods. In the pitch dark he could hardly see a thing, so he stepped down the porch stairs and went a short distance along the boardwalk that led through the trees to the cottages. The walk, he noticed, was slightly damp. Apparently, a fine rain had fallen sometime while he was inside having his supper. He also noticed that though the wind was still up, the sky overhead was not so dark as before; indeed, it seemed to be clearing off some. This was not what he had expected. Windstorms on the mountain nearly always meant a heavy downpour almost immediately after -- "thunder-gusts" the local men called them. Parke had been through several already in the time he had been at the lake and knew what to expect. It would be as though the whole sky were laying siege to the burly landscape. The rain would drum down like an unyielding river. Lightning would flash blue-white, again and again across the sky, and thunderclaps would boom back and forth down the valley like a cannonade, rattling every window along the lakeshore. Then, almost as suddenly as it had started, the siege would lift, and silent, milky steam would rise from the surface of the water and the rank smell of the sodden forest floor would hang on in the air for hours. Tonight, however, it appeared there was to be no storm. Parke turned and walked back inside. About nine-thirty he went upstairs, climbed into bed, and went to deep. About an hour and a half later, very near eleven, the rain began. It came damming through the blackness in huge wind-driven sheets, beating against the clubhouse, the tossing trees, the lake, and the dark, untamed country that stretched off in every direction for miles and miles. The storm had started out of Kansas and Nebraska, two days before, on May 28. The following day there had been hard rains in Kansas, Missouri, Illinois, Michigan, Indiana, Kentucky, and Tennessee. Trains had been delayed, roads washed out. In Kansas, along the Cottonwood River, a dozen farms had been flattened by tornado-force winds and several people had been killed. In northern Michigan and parts of Indiana there had been sudden snow squalls. Warnings had been telegraphed east. On the night of the 29th the U.S. Signal Service issued notices that the Middle Atlantic states were in for severe local storms. On the morning of May 30 all stations in the area reported "threatening weather." When the storm struck western Pennsylvania it was the worst downpour that had ever been recorded for that section of the country. The Signal Service called it the most extensive rainfall of the century for so large an area and estimated that from six to eight inches of rain fell in twenty-four hours over nearly the entire central section. On the mountains there were places where the fall was ten inches. But, at the same time, there were astonishing disparities between the amount of rainfall at places within less than a hundred-mile radius. At the South Fork Fishing and Hunting Club, for example, a pail left outside overnight would have five inches of water in it the next morning when the rain was still coming down. The total rainfall at the clubhouse would be somewhere near seven inches. In Pittsburgh, just sixty-five miles to the west as the crow flies, the total rainfall would be only one and a half inches. But as the storm beat down on the mountain that night, John G. Parke, Jr., who would turn twenty-three in less than a month, slept on, never hearing a thing. Most of the holiday crowds were back from the cemetery by the time the rain began Thursday afternoon. It had been the customary sort of Memorial Day in Johnstown, despite the weather. People had been gathering along Main Street since noon. With the stores closed until six, with school out, and the men off from the mills, it looked as though the whole town was turning out. Visitors were everywhere, in by special trains from Somerset, Altoona, and other neighboring towns. The Ancient Order of Hibernians, "a stalwart, vigorous looking body of men," as the Johnstown Tribune described them, was stopping over for its annual state convention. Hotels were full and the forty-odd saloons in Johnstown proper were doing a brisk business. The Reverend H. L. Chapman, who lived two doors off Main, in the new Methodist parsonage facing the park, later wrote, "The morning was delightful, the city was in its gayest mood, with flags, banners and flowers everywhere...we could see almost everything of interest from our porch. The streets were more crowded than we had ever seen before." The parade, late starting as always, got under way about two-thirty, marched up Main, past the Morrell place, on by the Presbyterian Church and the park, clear to Bedford Street. There it turned south and headed out along the river to Sandy Vale, where the war dead were buried. The fire department marched, the Morrellville Odd Fellows, the Austrian Music Society, the Hornerstown Drum Corps, the Grand Army Veterans, and the Sons of Veterans, and half a dozen or more other groups of various shapes and sizes, every one of them getting a big cheer, and especially the Grand Army men, several of whom were beginning to look as though the three-mile tramp was a little more than they were up to. How much things had changed since they had marched off to save the Union! It had been nearly thirty years since Lincoln had first called for volunteers. Grant and Lee were both dead, and there were strapping steelworkers with thick, black mustaches standing among the crowds along Main Street who had been born since Appomattox. At the start of the war Johnstown had been no more than a third the size it was now; and ten years before that, it had been nothing but a sleepy little canal town with elderbushes growing high along Main, and so quiet you could hear the boat horns before the barges cleared the bend below town. But ever since the war, with the west opening up, the Cambria Iron Company had had its giant three-ton converters going night and day making steel for rails and barbed wire, plowshares, track bolts, and spring teeth for harrows. The valley was full of smoke, and the city clanked and whistled and rumbled loud enough to be heard from miles off. At night the sky gleamed so red it looked as though the whole valley were on fire. James Quinn, one of Johnstown's most distinguished-looking Grand Army veterans and its leading dry-goods merchant, enjoyed few sights more. "The sure sign of prosperity," he called it. Years after, Charlie Schwab, the most flamboyant of Carnegie's men, described the view of Johnstown from his boyhood home in the mountain town of Loretto, nearly twenty miles to the northeast. "Along toward dusk tongues of flame would shoot up in the pall around Johnstown. When some furnace door was opened the evening turned red. A boy watching from the rim of hills had a vast arena before him, a place of vague forms, great labors, and dancing fires. And the murk always present, the smell of the foundry. It gets into your hair, your clothes, even your blood." Most of the men watching the parade that Memorial Day would have taken a somewhat less romantic view. In the rolling mills they worked under intense heat on slippery iron floors where molten metal went tearing by and one false step or slow reaction could mean horrible accidents. Most of them worked a ten- or even twelve-hour day, six days a week, and many weeks they worked the hated "long turn," which meant all day Sunday and on into Monday. If they got ten dollars for a week's work they were doing well. A visiting journalist in 1885 described Johnstown as "new, rough, and busy, with the rush of huge mills and factories and the throb of perpetually passing trains." The mills were set just below town in the gap in the mountains where the Conemaugh River flows westward. On the hillside close to the mills the trees had turned an evil-looking black and grew no leaves. Johnstown of 1889 was not a pretty place. But the land around it was magnificent. From Main Street, a man standing among the holiday crowds could see green hills, small mountains, really, hunching in close on every side, dwarfing the tops of the houses and smokestacks. The city was built on a nearly level flood plain at the confluence of two rivers, down at the bottom of an enormous hole in the Alleghenies. A visitor from the Middle West once commented, "Your sun rises at ten and sets at two," and it was not too great an exaggeration. The rivers, except in spring, appeared to be of little consequence. The Little Conemaugh and Stony Creek, or the Stony Creek, as everyone in Johnstown has always said (since it is the Stony Creek River), are both more like rocky, oversized mountain streams than rivers. They are about sixty to eighty yards wide. Normally their current is very fast; in spring they run wild. But on toward August, as one writer of the 1880's said, there are places on either river where a good jumper could cross on dry stones. The Little Conemaugh, which is much the swifter of the two, rushes in from the east, from the Allegheny Mountain. It begins near the very top of the mountain, about eighteen miles from Johnstown, at a coal town called Lilly. Its sources are Bear Rock Run and Bear Creek, Trout Run, Bens Creek, Laurel Run, South Fork Creek, Clapboard Run and Saltlick Creek. From an elevation of 2,300 feet at Lilly, the Little Conemaugh drops 1,147 feet to Johnstown. The Stony Creek flows in from the south. It is a broader, deeper river than the other and is fed by streams with names like Beaver Dam Run, Fallen Timber Run, Shade Creek, and Paint Creek. Its total drainage is considerably more than that of the Little Conemaugh, and until 1889 it had always been thought to be the more dangerous of the two. When they meet at Johnstown, the rivers form the Conemaugh, which, farther west, joins the Loyalhanna to form the Kiskiminetas, which in turn flows into the Allegheny about eighteen miles above Pittsburgh. At Johnstown it was as though the bottom had dropped out of the old earth and left it angry and smoldering, while all around, the long, densely forested ridges, "hogbacks" they were called, rolled off in every direction like a turbulent green sea. The climb up out of the city took the breath fight out of you. But on top it was as though you had entered another world, clean, open, and sweetsmelling. In 1889 there were still black bear and wildcats on Laurel Hill to the west of town. Though the loggers had long since stripped the near hills, there were still places within an hour's walk from Main Street where the forest was not much different than it had been a hundred years before. Now and then an eagle could still be spotted high overhead. There were pheasants, ruffed grouse, geese, loons, and wild turkeys that weighed as much as twenty pounds. Plenty of men marching in the parade could remember the time before the war when there had been panthers in the mountains big enough to carry off a whole sheep. And it had been only a few years earlier when passenger pigeons came across the valley in numbers beyond belief. One January the Tribune wrote: "On Saturday there were immense flocks of wild pigeons flying over town, but yesterday it seemed as if all the birds of this kind at present in existence throughout the entire country were engaged in gyrating around overhead. One flock was declared to be at least three miles in length by half a mile wide." Still, many days there were in the valley itself when the wind swept away the smoke and the acrid smell of the mills and the air was as good as a man could ask for. Many nights, and especially in winter, were the way mountain nights were meant to be, with millions of big stars hanging overhead in a sky the color of coal. Looking back, most of the people who would remember Johnstown as it was on that Memorial Day claimed it was not as unpleasant a place as one might imagine. "People were poor, very poor by later standards," one man said, "but they didn't know it." And there was an energy, a vitality to life that they would miss in later years. Many of the millworkers lived in cheap, pine-board company houses along the riverbanks, where, as the Tribune put it, "Loud and pestiferous stinks prevail." But there were no hideous slums, such as had spread across the Lower East Side of New York or in Chicago and Pittsburgh. The kind of appalling conditions that would be described the next year by Jacob Riis in his How the Other Half Lives did not exist then in Johnstown. No one went hungry, or begging, though there were always tramps about, drifters, who came with the railroad, heading west nearly always, knocking at back doors for something to eat. They were part of the landscape and people took them for granted, except when they started coming through in big numbers and there were alarming stories in the papers about crowds of them hanging around the depot. One diary, kept by a man who lived outside of town, includes a day-by-day tramp count. "Wednesday, May 1, 1889, Two Tramps...Thursday, May 2, Two Tramps," and so on, with nearly a tramp or two every day, week after week. New people came to town, found a job or, if not, moved on again, toward Pittsburgh. But for most everyone who decided to stay there was work. Although lately, Johnstown men, too, had been picking up and going west to try their luck at the mills in St. Louis or the mines in Colorado. And lately the jobs they left behind were being filled by "hunkies" brought in to "work cheap." The idea did not please people much. Nor did it matter whether the contract workers were Italians, Poles, Hungarians, Russians, or Swedes; they were all called Hungarians, "bohunks" or "hunkies." But so far, and again unlike the big cities, Johnstown had only a few such men, and most of them lived in Cambria City, just down the fiver, beyond the new stone bridge that carried the main line of the Pennsylvania across the Conemaugh. The vast majority of the people who lined Main Street watching the parade were either Irish, Scotch-Irish, or Cornish (Cousin Jacks, they were called), German or Welsh, with the Germans and the Welsh greatly outnumbering all the rest. There were some Negroes, but not many, and a few of the leading merchants were Jews. The Germans and the Welsh had been the first settlers. More of them, plus the Scotch-Irish, had come along soon after to work in the mines and first forges. Quite a few of the big Irishmen in the crowd had come in originally to build the railroad, then stayed on. Johnstown had been an active stop along the Underground Railroad, and a few of the Negroes had come in that way. Others of them came later to work in the tannery. There were German and Welsh churches in town, a German newspaper, and several Irish fortunetellers. Welsh and German were spoken everywhere, along with enough other brogues, burrs, and twangs to make a "plain American" feel he was in a country of "feriners," or so it often seemed. The first white settlers in the valley had been Solomon and Samuel Adams and their sister Rachael, who came over the Allegheny Mountains from Bedford about 1771 and cleared a patch of land near the Stony Creek. Until then the place had been known as Conemack Old Town, after a Delaware Indian village that stood about where the Memorial Day parade had gathered that noon at the foot of Main. Samuel Adams and an Indian killed each other in a knife fight, and the traditional story is that Rachael was also killed by Indians soon after. Solomon made a fast retreat back to the stockade at Bedford, and it was not for another twenty years or thereabouts that the first permanent settler arrived. In 1794, about the time President Washington was sending an army over the mountains to put down the so-called Whiskey Rebellion in Pittsburgh, Joseph Schantz, or Johns, an Amish farmer from Switzerland, came into the valley with his wife and four children. He cleared off thirty acres between the rivers, raised a cabin, planted an orchard, and laid out a village which he called Conemaugh Old Town -- or just Conemaugh -- and which he had every hope for becoming the county seat. When the county was established in 1804 and given the old Latin name for Wales -- Cambria Ebensburg, a mountain village fifteen miles to the north, was picked as county seat. Three years later Joseph Johns sold his village and moved on. The next proprietor was a long-haired "York County Dutchman" (a Pennsylvania German) named Peter Levergood, and from then until the canal came through, the town remained no more than a backwoods trading center. But with the arrival of the canal it became the busiest place in the county. By 1835 Johnstown, as it was by then known, had a drugstore, a newspaper, a Presbyterian church, and a distillery. By 1840 its population, if the nearby settlements were counted, had probably passed 3,000. Then, in the 1850's, the Pennsylvania Railroad came through, the Cambria Iron Company was established, and everything changed. By the start of the 1880's Johnstown and its neighboring boroughs had a total population of about 15,000. Within the next nine years the population doubled. On the afternoon of May 30, 1889, there were nearly 30,000 people living in the valley. Properly speaking Johnstown was only one of several boroughs -- East Conemaugh, Woodvale, Conemaugh, Cambria City, Prospect, Millville, Morrellville, Grubbtown, Moxham, Johnstown -- which were clustered between the hills, packed in so tight that there was scarcely room to build anything more. Petty political jealousies and differences over taxes had kept them from uniting. As it was there was no telling where one began or the other ended unless you knew, which, of course, everyone who lived there did. Millville, Prospect, and Cambria City, it was said, lived on the pay roll of the Cambria mills; Conemaugh lived on the Gautier wire works, Woodvale on the woolen mills there, and Johnstown, in turn, lived on all the rest of them. Johnstown was the center of the lot, geographically and in every other way. It was far and away the largest, with a population of its own of perhaps 10,000 by 1889, which was four times greater than even the biggest of the others. The banks were there, the hotels, the jail, and a fulltime police force of nine. There were five-story office buildings on Main and up-to-date stores. The town had an opera house, a night school, a library, a remarkable number of churches, and several large, handsome houses, most of which were owned by men high up in the Iron Company. Much would be written later on how the wealthy men of Johnstown lived on the high ground, while the poor were crowded into the lowlands. The fact was that the most imposing houses in town were all on Main Street, and one of the largest clusters of company houses was up on Prospect Hill. The rest of the people lived in two- and three-story frame houses which, often as not, had a small porch in front and a yard with shade trees and a few outbuildings in back. Nearly everyone had a picket fence around his property, and in spite of its frenzied growth, the city still had more than a few signs of its recent village past. On the 22nd of May, for example, the town fathers had gathered at the City Council chambers to settle various matters of the moment, the most pressing of which was to amend Section 12 of Chapter XVI of the Codified Ordinance of the Borough of Johnstown. The word "cow" was to be inserted after "goat" in the third line, so that it would from then on read: "Section 12. Any person who shall willfully suffer his horse, mare, gelding, mule, hog, goat, cow, or geese to run at large within the Borough shall for each offense forfeit and pay for each of said animals so running at large the sum of one dollar..."
Life was comparatively simple, pleasures few. There were Saturday night band concerts in the park, and lectures at the library. Sundays half the town put on its best and went walking. Families would pick one of the neighboring boroughs and walk out and back, seeing much and, naturally, being seen all along the way. There was also the Unique Rink for roller skating, a fad which seemed to be tapering off some that spring. There was superb fishing along the Conemaugh and the Stony Creek in spring and summer. Downstream from town the river was stained by waste dumped from the mills, but above town the water still ran clear between sun-bleached boulders and was full of catfish, sunfish, mullet, walleyed pike that everyone mistakenly called salmon, trout, eels, and speedy, mud-colored crawfish. In spring, too, there was nearly always a good brawl when the circus came to town. In the fall, when the sour gums turned bloodred against the pines, there was wonderful hunting on the mountains, and fresh deer hanging from butcher shop meathooks was one of the signs of the season. In winter there were sleigh rides to Ebensburg, tobogganing parties, and ice skating at the Von Lunen pond across from the new Johnson Street Rail works up the Stony Creek at Moxham. And year round there was a grand total of 123 saloons to choose from in the greater Johnstown area, ranging from California Tom's on Market Street to the foul-smelling holes along the back alleys of Cambria City. California Tom Davis had been a forty-niner. He was one of the colorful characters of Johnstown and the back room of his saloon was the favorite gathering place for those professional men and Cambria Iron officials who liked to take a sociable drink now and then. But the average saloon was simply a place where a workingman could stop off at the end of the day to settle the fierce thirst the heat of the furnaces left him with, or to clear the coal dust from his throat. He was always welcome there, without a shave or a change of clothes. It was his club. He had a schooner of beer or a shot; most of the time he spent talking. Like any steel town Johnstown had a better than average number of hard-line drinking men. On payday Saturdays the bartenders were the busiest people in town. And week after week Monday's paper carried an item or two about a "disturbance" Saturday night on Washington Street or in Cambria City, and published the names of two or three citizens who had spent the night in the lockup for behaving in "frontier fashion." For those of still earthier appetite there was Lizzie Thompson's place on Frankstown Hill, at the end of Locust Street. It was the best-known of the sporting houses, but there were others too, close by, and on Prospect Hill. And one spring a similar enterprise had flourished for weeks in the woods outside of town, when several itinerant "soiled doves," as the Tribune called them, set up business in an abandoned coal mine. But primarily, life in Johnstown meant a great deal of hard work for just about everybody. Not only because that was how life was then, but because people had the feeling they were getting somewhere. The country seemed hell-bent for a glorious new age, and Johnstown, clearly, was right up there booming along with the best of them. Pittsburgh and Chicago were a whole lot bigger, to be sure, and taking a far bigger part of the business. But that was all right. For Johnstown these were the best years ever. Progress was being made, and it was not just something people were reading about. It was happening all around them, touching their lives. Streets were bright at night now with sputtering white are lights. There was a new railroad station with bright-colored awnings. The hospital was new; two new business blocks had been finished on Main. A telephone exchange had begun service that very year, in January, and already there were more than seventy phones in town. Quite a few houses had new bathrooms. The Hulbert House, the new hotel on Clinton Street, had an elevator and steam heat. There was a street railway out to Woodvale and another up to Moxham. Almost everyone had electricity or natural gas in his home. There were typewriters in most offices, and several people had already bought one of the new Kodak "detective" cameras. "Anybody can use the Kodak," the advertisements said. Inventions and changes were coming along so fast that it was hard to keep up with them all. The town had no debts, taxes were low, and the cost of things was coming down little by little. Of course, there were some who looked askance at so much change and liked to talk about the old days when they said there had never been so much drinking, no prostitution, and men could still do a day's work without complaining. There was also strong resentment against the company, and quiet talk of trouble to come, though it would have been very hard for most men among those Memorial Day crowds to have imagined there ever being an actual strike in the mills. The miners had tried it, twice, and both times the company had clamped down with such speed and decisiveness that the strikes had been broken in no time. And there were floods and fires and, worst of all, epidemics that hit so swiftly and unexpectedly, terrifying everyone, and killing so many children. The last bad time had been in 1879, when diphtheria killed 132 children within a few months. Death was always near, and there was never any telling when k would strike again. Year in, year out men were killed in the mills, or maimed for life. Small boys playing around the railroad tracks that cut in and out of the town would jump too late or too soon and lose a leg or an arm, or lie in a coma for weeks with the whole town talking about them until they stopped breathing forever. And besides, was k not a fine thing to be where there was so much going on, so much to keep a man busy and his family eating regularly? So far it had been a good year. Except for measles the town seemed pretty heathy. Talk was that it would be a good summer for steel. Prices might well improve, and perhaps wages with them, and there would be no labor trouble to complicate things, as there would probably be in Pittsburgh. The Quicksteps, Johnstown's beloved baseball team, had made a rather poor showing so far, losing to Braddock, Greensburg, and McKeesport in a row; but they had beaten Altoona once, and most people felt that about made up for it. The newspapers were full of stories about the World's Fair opening in Paris, and its Eiffel Tower, and about the Oklahoma Territory opening up out west. Towers of structural steel could reach nearly to the heavens, and Americans could turn a dusty prairie into farms and whole new cities overnight. It was some time to be alive. But perhaps best of all there seemed such a strong spirit of national unity everywhere. The Constitutional government those Grand Army veterans had fought for had just celebrated its one hundredth birthday that spring and there had been quite a to-do about it in the newspapers and picture magazines. "A nation in its high hour of imperial power and prosperity looks back a hundred years to its obscure and doubtful beginning..." one article began. That the next one hundred years would be better still, bringing wondrous advantages and rewards to millions of people who had also come from "obscure and doubtful" beginnings, seemed about as certain as anything could be; and especially in a place like Johnstown, on a day when flags were flying from one end of town to the other, and the "Boys in Blue" were marching again. When the rain started coming down about four o'clock, it was very fine and gentle, little more than a cold mist. Even so, no one welcomed it. There had already been more than a hundred days of rain that year, and the rivers were running high as it was. The first signs of trouble had been a heavy snow in April, which had melted almost as soon as it came down. Then in May there had been eleven days of rain. The rivers ran high every spring. That was to be expected. Some springs they ran so high they filled the lower half of town to the top doorstep. A few times the water had been level with first-floor windows along several streets. Floods had become part of the season, like the dogwood blooming on the mountain. Yet, each year, there was the hope that perhaps this time the rivers might behave themselves. It had already been such a curious year for weather. A tornado in February had killed seventeen people in Pittsburgh. Not much had happened in Johnstown, but the wind carried off a tin church roof at Loretto. The April snow had been the heaviest of the whole year, with fourteen inches or more in the mountains. And all through May, temperatures had been bouncing every which way, up in the eighties one day, down below freezing two nights later, then back to the eighties again. Now it felt more like March than May. About five the rain stopped and left everything freshly rinsed looking. The Reverend Chapman, back on his front porch after participating at the graveside ceremonies, sat gazing at the park with its big elms and draped chain fence, and thought to himself that he had seldom looked upon a lovelier scene. Or at least so he wrote later on. The Reverend had been in Johnstown only a few years, and k had been just the month before that he and his wife, Agnes, had moved into the new parsonage. He had grown up along the canal to the west of Johnstown, at Blairsville, where his father had eked out a living painting decorative scenes and designs on packet boats. His first church had been in Ligonier, on the other side of Laurel Hill. Later there had been churches in New Florence and Bolivar, down the Conemaugh, and half a dozen other places between Johnstown and Pittsburgh. He liked every one of them, he said, but Johnstown was something special. His stone church next door was the largest in town, a landmark, and except for St. Joseph's, the German Catholic church over in Conemaugh borough, no church had a larger membership. His neighbors across the park, Dr. Lowman and John Fulton, were the finest sort of Christian gentlemen, and their homes were as elegantly furnished as any in town. The Dibert bank, Griffith's drugstore, the post office and the Tribune offices on the floor above it, were all but a few steps from the Reverend's front door. The parsonage faced on to Franklin Street, at almost the exact dead center of Johnstown. Night settled in and the lights came on along Franklin and Main. A few blocks away William Kuhn and Daisy Homer were being married in a small ceremony at the bride's home. At the Opera House Mr. Augustin Daly's New York production of A Night Off, "The comedy success of two continents," was playing to a small house. Daly was the foremost theatrical producer of the day, and A Night Off had been his biggest hit for several years. Like some of his other productions, it was an adaptation from a German comedy, a fact which the Johnstown audience undoubtedly appreciated. Other than that not much else was going on. Because of the holiday there had been no paper that morning, but according to Wednesday's Tribune, rainstorms were expected late that Thursday; tomorrow, Friday, was to be slightly warmer. The barometric pressure was reported at thirty, temperature from forty-six to sixty-five, humidity at sixty-nine per cent. About nine the rain began again, gentle and quiet as earlier. But an hour or so later it started pouring and there seemed no end to it. "Sometime in the night," according to Chapman, "my wife asked if it were not raining very hard, and I being very sleepy, barely conscious of the extraordinary downpour simply answered, 'Yes,' and went to sleep, thinking no more of it until morning." George Heiser's day did not end until after ten. It was his practice to keep the store open until then. With the saloons along Washington Street doing business on into the night, there were generally people about and he could pick up a little more trade. Either he or his wife Mathilde would be looking after things behind the counter, in among the queen's ware and the barrels of sugar and crackers, the cases of Ewarts tobacco and yellow laundry soap, needles, spools, pins, and Clark's "O-N-T" (Our New Thread). George and Mathilde Heiser, and their sixteen-year-old son, Victor, lived upstairs over the store. They had been at the same location, 224 Washington, for several years now and, at long last, business was looking up. At fifty-two, for the first time in his life, George Heiser was getting on in the world. Washington Street ran parallel to Main, two blocks to the north. From the Stony Creek over to the Little Conemaugh, the east-west streets -- the "up" streets they were called -- ran Vine, Lincoln, Main, Locust, Washington. Then came the B & O tracks and the B & O depot which was directly across the street from the Heiser store. Beyond the tracks were two more streets, Broad and Pearl, then the Little Conemaugh, and on the other side of that rose Prospect Hill, steep as a roof. With the town growing the way it had been, the Baltimore & Ohio had brought in a spur from Somerset eight years before to try to take away some of the freight business from the Pennsylvania. An old schoolhouse had been converted into a depot, and the steady night and day racket of the trains right by their window had made quite a difference to the Heisers. But with the store doing as well as it was, George Heiser had few complaints. George had been troubled by bad luck much of his life. During the war, at Fredericksburg, when his unit had been making a rapid withdrawal, his companion in the ranks, a fellow named Pike, got hit and went down grabbing on to George's leg and pleading for George not to leave him. As a result they were both captured and George spent the rest of the war in Libby Prison. Then, years later, at a time when he seemed to be getting nowhere in Johnstown, George had gone off north to Oil City hoping to strike it rich. He wound up running a butcher shop instead and in no time was back in Johnstown, flat broke, wiped out by fire and his own lack of business sense. George had not marched in the parade that afternoon. His blue uniform seldom ever came out of the big wardrobe upstairs. He was not much for parades and the like. He seldom mixed in politics, never became an enthusiastic church man. He neither smoked nor chewed, though he would take a beer every so often and once a year he liked to make wine down in the cellar. He did enjoy the Grand Army meetings, but that was largely because he enjoyed being with his friends. People liked him. He was a good storyteller, easygoing. He was also about as physically powerful as any man in town, and he was a very soft touch. He could lift a barrel full of sugar, which was considered quite a feat; but naming away a friend whose credit might not be the best seemed more than he was up to. Twice in his life he had let friends have money when they came to him; twice he had suffered heavily from the loss. Fortunately for the Heisers, Mathilde was a determined and sensible wife. She was the manager of the two, and after George came back from Oil City she took charge. She kept the books, saw that he did not let much go on credit. Nor would she allow him to set any chairs out on the bare wooden floor. Otherwise, she said, his cronies would be sitting about half the day giving the place the wrong sort of appearance. They had at last been able to add a new window to the store front and appearances would be maintained so long as Mathilde had her say. Mathilde's appearance was straightforward and intelligent. She had a fine head of dark-brown hair, a high forehead, and a set to her mouth that suggested she knew where she was going and that chances were good she would get there. She had had a considerable amount of education for a woman of that time and continued to keep up with her reading. Education was the thing, a proper education and hard work. It had been her way of life since childhood in Germany, and she intended to pass it on to the pride of her life, her son. Victor was her second child. The first, a girl, had died of diphtheria. Victor had been struck down with it too, but he had been stronger. He looked much like his father now, only a ganglier, rawboned version. He was a serious, pink-faced boy, with big feet and blond hair, taller already than most men and far better educated. At sixteen he knew several languages, was well along in advanced mathematics, and had read about as widely as any boy in Johnstown. At his mother's insistence, his life was a steady round of school, homework, and being tutored in one extra course or another. If George Heiser had had his troubles making his way, that was one thing; Victor, Mathilde Heiser was determined, would not just get on, he would excel. There would be no going off to the Cambria works or coal mines for this young man, and no clerking behind a store counter either. Now and again Victor had his moments away from all that. His father would step in and see that he got some time off. George Heiser had a wonderful way with children. He was forever telling them stories and listening to theirs. He took a great interest in his son and his schemes, one of which was to build a raft and float down the Conemaugh to the Allegheny, then on to the Ohio and Mississippi. Victor had taken some night classes in mechanical drawing at the library and had worked up plans on how the raft should be built. His idea was to catch the Conemaugh when it was high, otherwise he knew he would run aground. In summer he would bring home accounts of his long rides out of town to the open country above the valley. Once he and one of his friends had gone all the way to the South Fork dam to take a look at the lake and the summer colony, but they had been sent on their way by the grounds keeper and never got to see much. Other nights Victor talked about walking to the edge of town to watch the big summer revival meeting. He loved the powerful singing and the whooping and hollering of people "getting religion." On the way home he and his friends would try to imitate what they had seen, laughing and pounding each other on the back as they came along the streets. This was the kind of education George Heiser understood. He had grown up in Johnstown himself. His people had been among the Pennsylvania Germans who first settled the valley. After ten the Heiser store was closed for the day, the lights out downstairs. When the downpour began, George and Mathilde did not think much of it, except that there would almost certainly be high water in the morning. But the thought bothered them very little, except for the inconveniences there might be. They listened to the rain drum on the roof and were glad to be inside. If there was such a thing as a typical married couple in Johnstown on the night of May 30, 1889, George and Mathilde Heiser would come about as close as any to qualifying. Together, like Johnstown itself, they combined an Old World will to make good in the New with a sort of earlier-American, cracker-barrel willingness to take life pretty much as it came. Unlike a large number of Johnstown people, they were not directly beholden to the Cambria Iron Company, but their fortunes, like those of the entire valley, depended nonetheless on how red those skies glowed at night. They had suffered the death of a child; they had tried their luck elsewhere and had lost. They fought dirt daily, saved every spare nickel, and took tremendous pride in the progress they were making. All things considered, Johnstown seemed a good place to be. It was their home. The New Yorker A first rate example of the documentary method....Mr. McCullough is a good writer and painstaking reporter and he has re-created that now almost mythic cataclysm...with the thoroughness the subject demands. 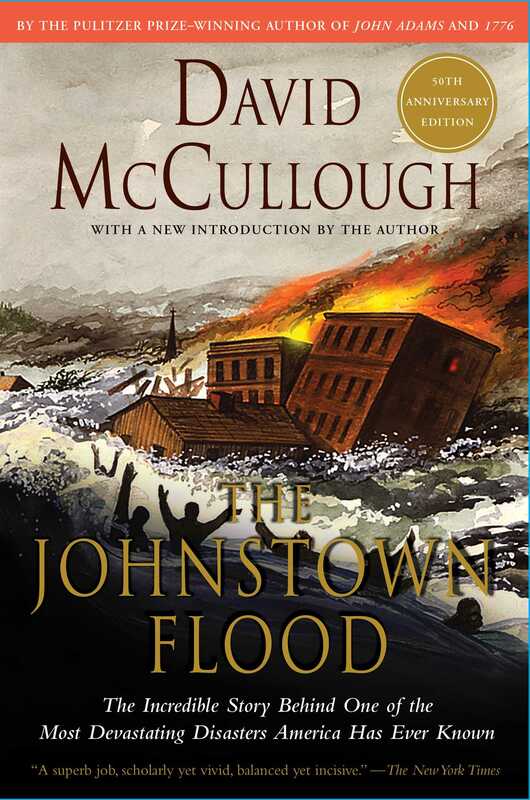 Book World McCullough has resurrected the flood for a generation that may know it in name only. He proves the subject is still fresh and spectacular.